For those new to the Session the idea is on the first Friday of every month beer bloggers from around the world unite and write a post on a common topic. Find more info here. This month Oliver from Literature & Libations has come up with a topic that piqued my interest and made me end my unexpectedly long absence from The Session. Basically we are trying to review a beer, without reviewing a beer. Now I know that makes close to no sense, so I'm going to try and explain that a little more succinctly. No beer terminology, no talking about different elements of the beer, just telling a story that explains what you thought of the beer. It certainly doesn't sound easy but I've been thinking about it all day and think I've come up with an idea. 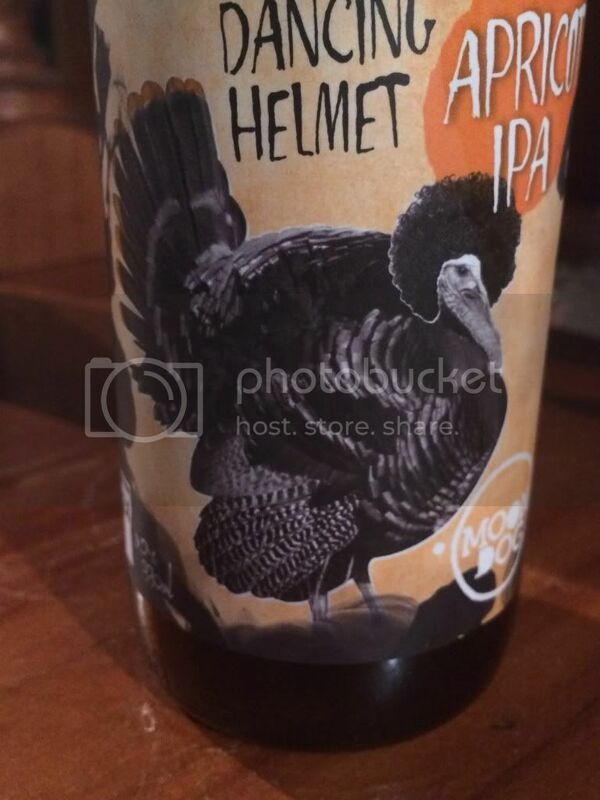 First and foremost I'm reviewing Moon Dog's Mustafa's Dancing Helmet Apricot IPA. This is certainly going to be an alternative review! Instead of talking about the beer today, I'm going to try and tell the story of the beer through the label. So the guy in the picture above is Mustafa and this is the story of him and his dancing helmet. Mustafa is a pretty stunning looking turkey! He struts around the forest like he's the coolest turkey around. That's probably because he is! With his big bold afro on top this turkey has all the hens (actual word for the female turkey) wanting a piece of him. The forest Mustafa lives in was called the Apricot Forest. The forest was so named because of the abundance of apricot trees that it house underneath the taller trees. The subsequent aroma coming from the trees made everything in the forest smell slightly sweet despite the turkeys often digging up the wet earth in the forest as a mating call. Mustafa was particularly used to the earthy smell, rarely walking on unscratched ground due to all the hens flocking to him! Late one night Mustafa ran into a dog howling at the moon. Mustafa asked the dog why he was sitting howling at the moon and disturbing the forest so late at night. The dog replied that he'd been busy gathering spices and got a little high and thought the moon wanted to fight him. The dog looked quizzically at Mustafa next and asked "Why are you wearing a dancing helmet?" Mustafa thought carefully before replying; "I think you might have had too much..."
The rest of the evening was a blur for all involved. Mustafa hazily remember the scratching of some earth, the spices that he had later shared with the moon dog and the apricots that were a part of his everyday life. He wondered what happened to his friend the dog. He never did see that moon dog again, but as an old turkey he did hear a story of the dog teaming up with a smart pig to teach people about lager. I don't know if that piece does any justice to Moon Dog's beer but it is out there and now that I've finished it I may as well post it... It's certainly a beer worth checking out if you like IPA's with a bit of a difference. Also for those who the last paragraph is lost on (I assume everyone except my now quite drunk self) try Moon Dog's Love Tap 2, it's awesome! Cheers guys, more normal posts will return tomorrow!